Three Piece were approached by Amersham Cricket Club to help with their annual Summer Ball event, which offers different themes each year, aiming to raise funds for the venue. There were many successful years previously, but the club never had the option of using a cocktail bar, which the event organisers anticipated bringing in an extra revenue beyond the usual beer, wine and mixers bar. 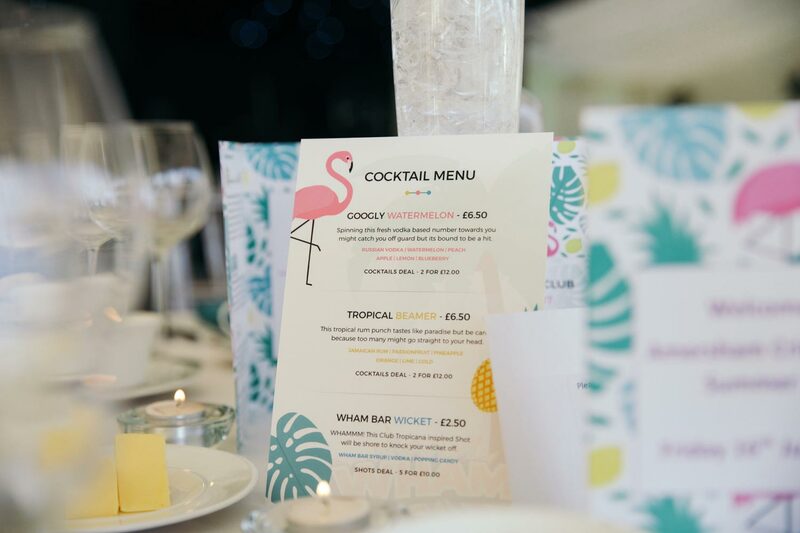 Therefore, with over 200 expected guests, Three Piece were asked to design and serve a unique cocktail menu to match the event theme of the year - Club Tropicana. 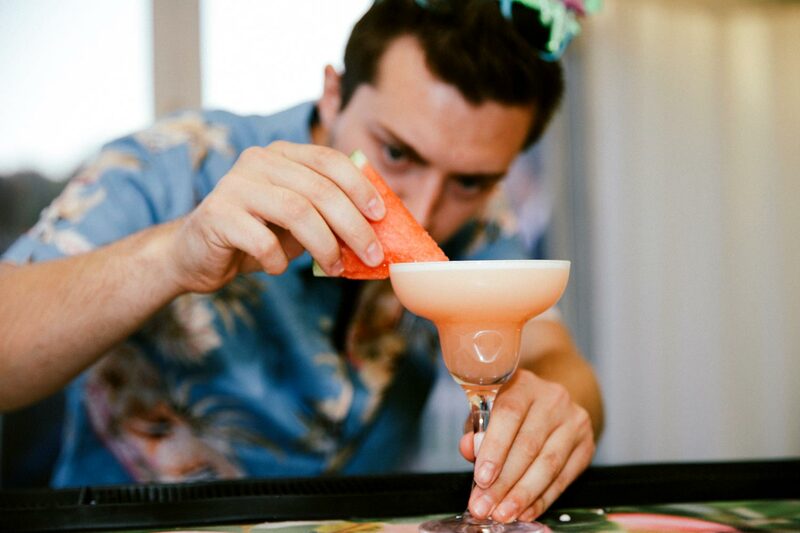 The goal was to make fun and exciting cocktails, that made the senses feel tropical and also nodded towards cricket in some way. With over three months for preparation, the team had plenty of time to make the drinks service totally bespoke and truly memorable for the guests. They spent the first month researching and testing ideas that would add some “George Michael, Wham!” vibes into the mix. Then in the run up to the big day the focus was on an easy, clean set up for the best possible service. The event consisted of welcome drinks, a three course meal, group games and competitions, cocktails, live music and dancing. Three Piece were available to serve cocktails from the start, as an alternative to welcome drinks or table wine. Mocktails were also available, which still offered guests the excitement of a unique drink and service from the bartender. The cocktails were created specifically for this event, to match the theme of the flyers in colour, style and name. As well as two main cocktails, which could be altered to mocktails, there was a special shot with popping candy! Tropical Beamer. A long Rum drink, bright yellow in colour with a glitter pineapple garnish. The name refers to a cricket ball that is delivered above waist-height by the bowler. Googly Watermelon. A short Gin drink in a margarita style, full of watermelon & peach flavours. The name refers to a deceptive cricket ball delivered by a right-arm spin bowler. 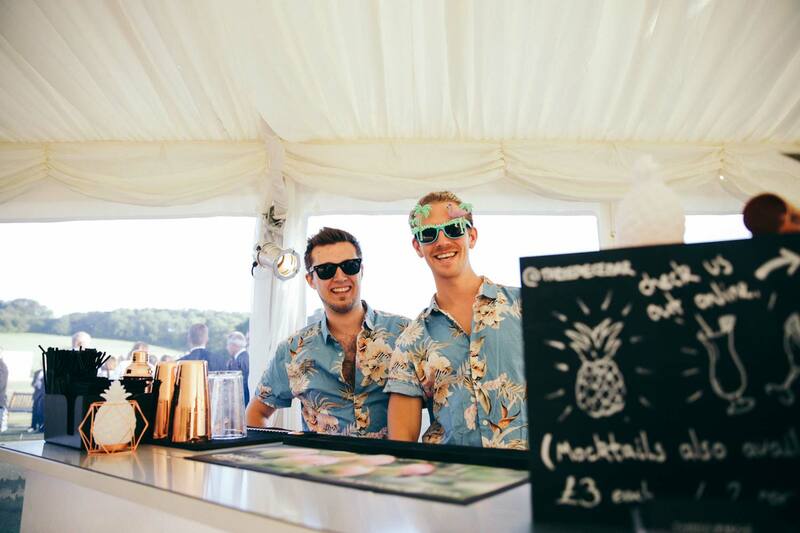 During the event, Three Piece were dressed in tropical-themed shirts, to add some colour and character to the bar setup. The bar was equipped with glowing pineapples, watermelon jugs, rose gold shakers, pink bar matts and custom cocktail menus. Menus were also placed on each table to encourage guests to purchase drinks at the bar during the meal. As the event was a fundraiser for the Cricket Club, guests were spending freely and happy to embrace the luxury of cocktails over the whole evening period. Groups enjoyed the service of cocktails in pairs as a 2 for 1 deal encouraged purchasing multiple drinks, therefore making more profit for the Club. As always, the team repeatedly delivered perfect cocktails, never compromising quality for quantity. 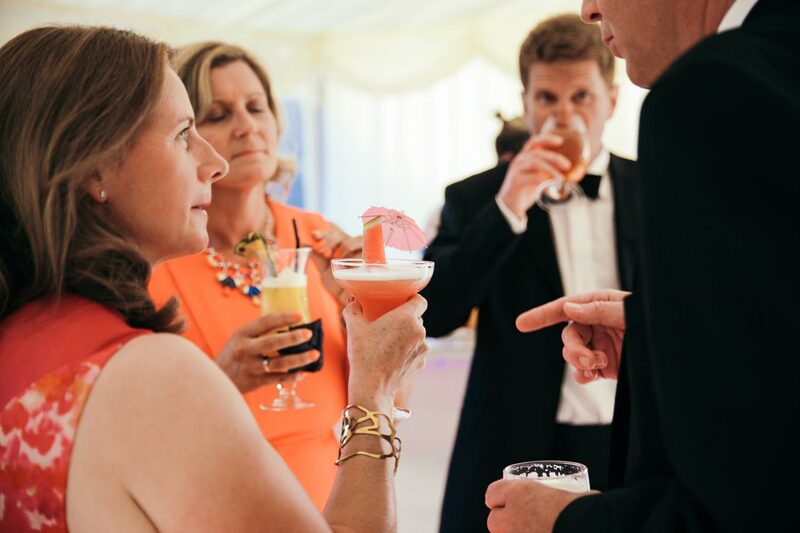 As this was the first time Amersham Cricket Club had included a cocktail bar, the event organisers had no previous figures for bar service, so Three Piece had to make an educated guess on the quantity of stock, ice, glassware and bar staff required for a private event of this scale. 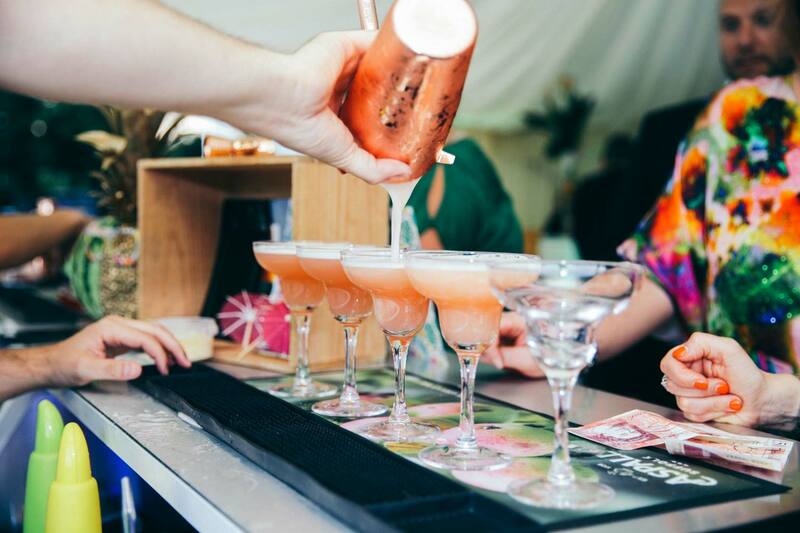 With 200 guests attending, the team factored for an average of 2 cocktails per guest, however this was not reached and it left a large amount of wasted ice, fruit and spare stock. Due to the welcome drinks and table wine available, Three Piece had not accounted for the fact that guests would enjoy the free drinks first (of course), then move onto cocktails afterwards. Therefore the first 3 hours of service were very slow, hindering the cocktail sales even more and little profit was made on the cocktail bar. This was followed by a large number of guests moving to the bar after dinner, to order cocktails on mass. This made it very hard for the bartending team to judge the best way to serve, but as always they managed effectively and served immaculate cocktails. As the event was a fundraiser the committee kept drinks prices low and the agreed price for cocktails was £6.50 each, or 2 for £12. Three Piece felt this was too low and the point was proven when guests commented on the cheap prices and in turn bought 6 - 10 drinks at a time. It is very unlikely to be able to judge an event to the exact quantities required, however from this experience Three Piece are able to gauge an audience even better than before and cater to the specific needs of each event, factoring in some of the errors mentioned above. Amersham Cricket Club enjoyed the service so much, they booked Three Piece again for 2018! This, some would say, is the perfect result. Three Piece donated 20% of profits to the Cricket Club, totalling £119. Three Piece aim to streamline service for fundraising events, making sure that profits are maximised and wastage is decreased as much as possible. This will be achieved by making sure the original consultation is thorough, producing a water-tight brief, and questioning / analysing effectively. Amersham Cricket Club booked Three Piece Bar again for next year, which is the perfect result.